Growing up, did you always dream of becoming an artist? Yes. It’s a bit frightening. How did you get to where you are today? Oh gosh, well, where I am today is my living room in Greenpoint, but I guess that in general I tend towards really hard work, letting myself get excited, and never being satisfied with anything. Describe your studio space. Since my last residency ended, it lives in my head. Due to the combination of my habit of walking/looking for found objects, and unreasonable rates for studio space in New York, I am increasingly interested in a mobile practice. When I do have a studio, it tends to be an extension of my living space—inviting, warm, weird. They tend to be slightly domestic spaces that can be stripped down in an hour for a big project. For several years now, you’ve worked on various window displays for Bergdorf Goodman. What is that experience like, and how does it differ from doing other kinds of installations? Working in display is a rush—it is fast and loose, and it is all about surface and illusion. It holds a special place in my heart, and the people who run the visual department (especially David Hoey, the director) are utterly brilliant. David taught me so much about taking risks, working long hours with amazing materials, working collaboratively, and not being too precious about anything. Someone once told me that the Bergdorf windows are a “beauty service to the city of New York,” and I’ve always loved that idea. It has been a wonderful day job for me as an artist living in New York. On my own, I try to be slow, intuitive and responsive, and projects often take weeks to years to complete (which would not go over well with a commercial art director). I often have to live with something for a long time before I can see what it needs, and I feel a spiritual connection to them by the time they are finished. Of course, every once in a while something will emerge fully formed on an instant, but when that happens I’m usually deep in a groove. I am drawn to working with worthless, odd and sometimes dirty objects (old dime bags, hair extensions, remnant fabrics, rusty nails) perhaps partly in response to all those years of display glitz. You recently served as the artist in residence for the Select Fair at Industry City. 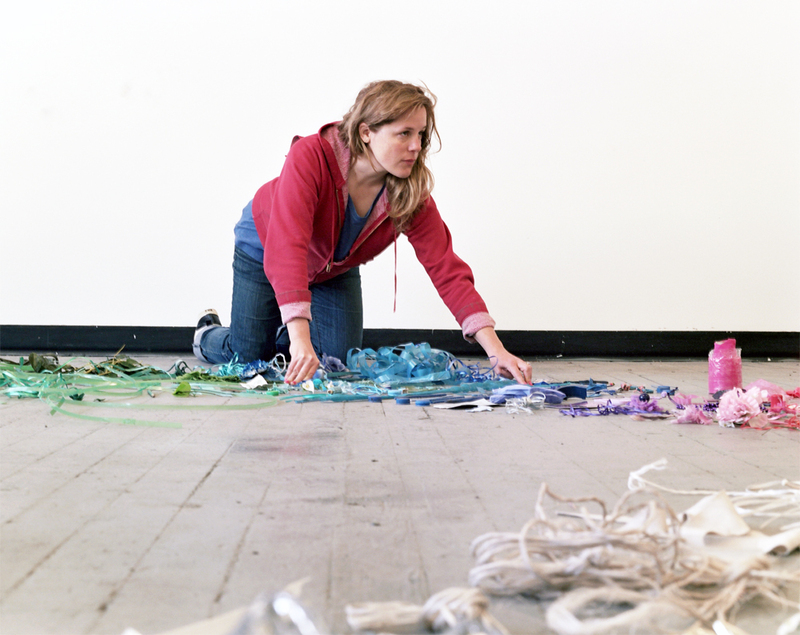 Could you talk about your site-specific installation for your residency? Absolutely. It was terrific. I was in a great position for that residency to come along. I had been looking for a venue for this project for a while, one where I took daily walks through a community and collected objects as sort of an anthropological study, or a survey of what a community abandoned. I have been collecting objects this way for my work for years—and turning the findings into a rosary or a series of tassels—but never in such a time sensitive and site-specific way. The focus excited me. Walking has always been a solitary process for me, and with good reason (I think better, notice more, and constantly stop to examine things), but once I got to Sunset Park I was so intrigued by the neighborhood that I wanted to include friends, colleagues, and artists I had been wanting to spend time talking with. The work really took off from there, and the dialogue intensified. Keeping a blog for the residency became a way to document both the character of the time spent with each guest walker, and a presentation of what we found. Inviting other creative people really strengthened my own sense of the project, and many two-dimensional pieces—photographs and collages—were spawned in the process. The resulting work, the Cypher, was even more site-specific than I expected. 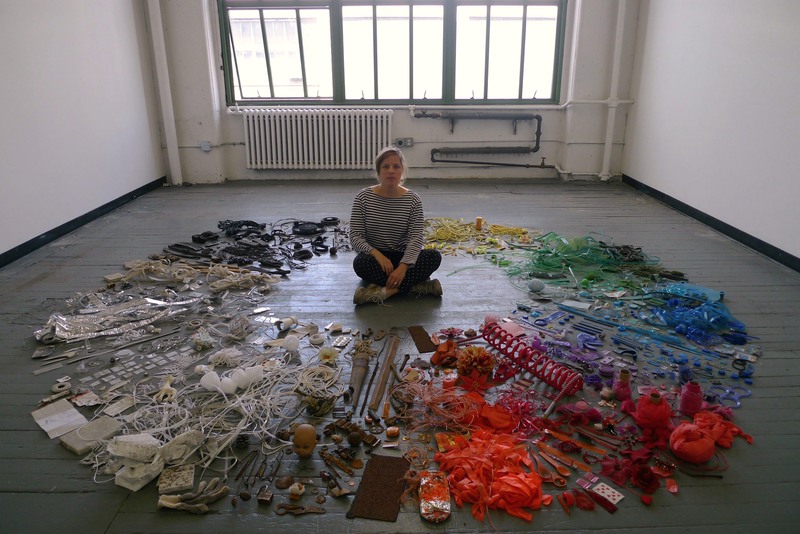 The objects we found on our walks were brought into the studio, documented and organized solely by color. The colors dictated their own ad-hoc color wheel. The studio, on the top floor of the Industry City studios building, became implicated in the work as well. The cost of the studios there has become incredibly high, which is amazing considering how far south in Brooklyn it is, and how removed the surrounding neighborhoods feel from that kind of wild, high priced real estate development speculation. Bringing a collection of garbage from the streets below, and arranging them carefully in that overpriced room felt powerful and a bit spiritual. What’s next on the horizon for you? 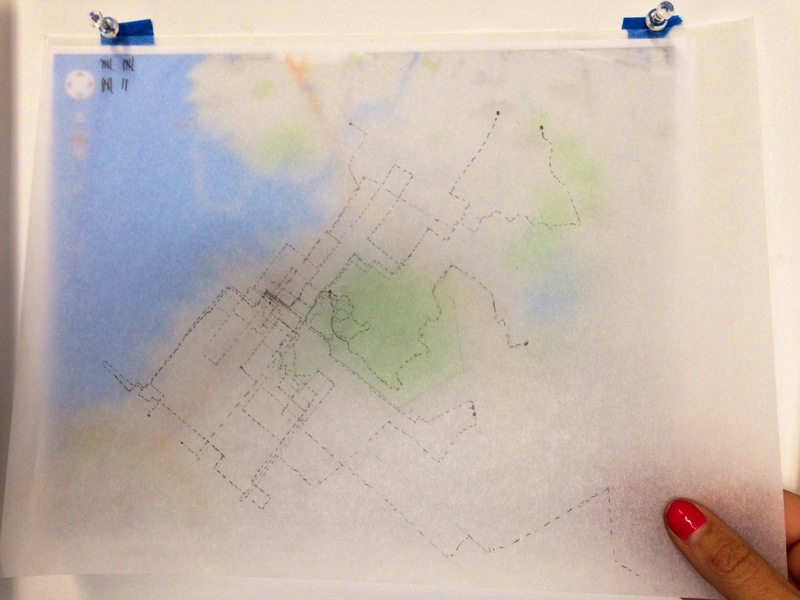 I am pursuing more walking projects, many inspired by the Select residency. I’d like to push the social structure of my practice, inviting many more creative people to walk with me in different neighborhoods. The walks are a really special, focused time that take the place of a traditional studio visit: They are more collaborative, less awkward. I’d also love to make a series of zines for each neighborhood or city. One specific project that I am really excited about involves making whimsical, oversized found-object based sculptural clothes for one of the lesser-known female Dada poets (who like me, walked the streets of New York collecting found objects and assembling them). Keeping my fingers crossed on that one.